This is quite possibly going to be the easiest pinterst contest you are ever going to enter. You don't have to make a board or pin a zillion images for the chance to win a $350 gift certificate to The Dessy Group or a $250 gift card. To enter, follow the three simple steps below. Entering is as easy as 1,2,3. 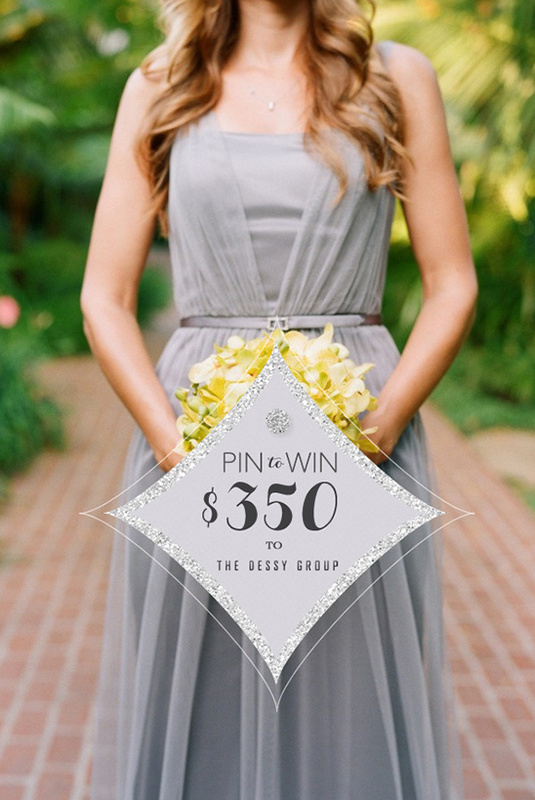 Read on learn exactly how to Pin it to win it! The pretty Dessy bridesmaid dress you see above is from Elizabeth Messina . Step 3. On each image add the hash tag #dessy♥weddingchicks You must have the #dessy♥weddingchicks in the comment box to be entered to win, (hint hint ... copy and paste the hash tag above into the description box). We will be repining your pins to this board here. Read on for more rules and regulations. We will announce the winner on December 18, 2012 on Wedding Chicks so be sure to check back. • Contest runs from today Dec 1, 2012-Dec 17, 2012. • Multiple entries are allowed per person. 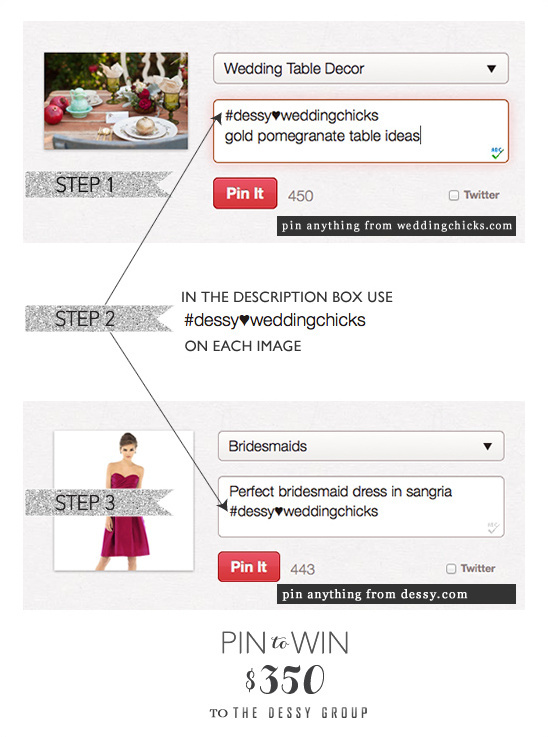 The Pinterest username used to Pin images or products from Weddingchicks.com or Dessy.com will be the identity of the entrant. • One winner of a $350 gift certificate will be awarded to the winner or a substitute of $250 cash card. • Winner will be announced on December 18, 2012 and must be respond by Tuesday December 22, 2012. If we are not contacted another winner will be chosen.